This teenager lived alone with his father, and the two of them had a very special relationship. 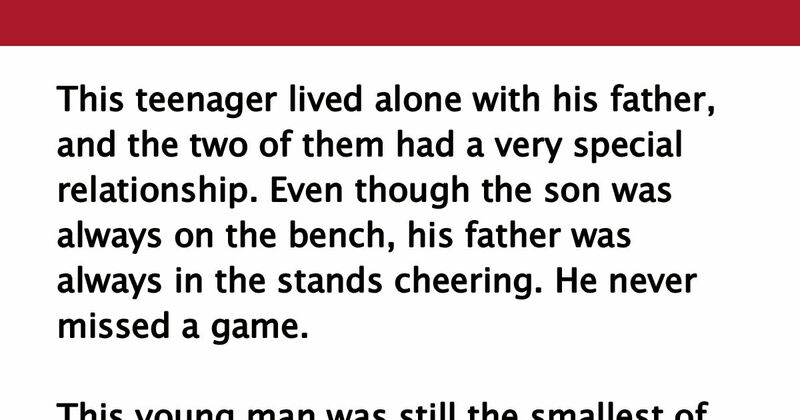 Even though the son was always on the bench, his father was always in the stands cheering. He never missed a game. This young man was still the smallest of the class when he entered high school. But his father continued to encourage him but also made it very clear that he did not have to play football if he didn’t want to. But the young man loved football and decided to hang in there. He was determined to try his best at every practice, and perhaps he’d get to play when he became a senior. All through high school he never missed a practice nor a game, but remained a benchwarmer all four years. His faithful father was always in the stands, always with words of encouragement for him. When the young man went to college, he decided to try out for the team as a “walk-on.” Everyone was sure that he could never make the cut, but he did. The coach admitted that he kept him on the roster because he always puts his heart and soul into every practice and at the same time, provided the other members with the spirit and hustle they badly needed. The news that he had survived the cut thrilled him so much that he rushed to the nearest phone and called his father. His father shared his excitement and was sent season tickets for all the college games. This persistent young athlete never missed practice during his four years at college, but he never got to play in the game. It was the end of his senior football season, and as he trotted onto the practice field shortly before the big playoff game, the coach met him with a telegram. The young man read the telegram and he became deathly silent. Saturday arrived, and the game was not going well. In the third quarter, when the team was 10 points behind, a silent young man quietly entered the locker room and put on his football gear. As he ran onto the sidelines the coach and his players were astounded to see their faithful teammate back so soon. “Coach, please let me play. I’ve just got to play today,” said the young man. Before long, the coach, the players and everyone in the stands could not believe their eyes. The little unknown, who never played before, was doing everything right. The opposing team could not stop him. He ran, he passed, blocked and tackled like a star. His team began to triumph. The score was soon tied. In the closing seconds of the game, this kid intercepted a pass and ran all the way for the winning touchdown. The fans broke loose. His teammates hoisted him onto their shoulders. Such cheering you’ve never heard. He looked at the coach, with tears in his eyes, and said, “Well, you knew my dad died, but you didn’t know that my dad was blind.” The young man swallowed hard and forced a smile. SHARE this story with your friends on Facebook if it touched your heart!